Like most of you, I watched last night's Lions/Cowboys game in real time. Unlike most of you, I'm guessing, I watched it with the sound off. After a long weekend of football, I didn't want to get unnecessarily worked up over something stupid, which is pretty much a sunk cost of listening to an NFL broadcast. If I consider myself lucky today, it's because I didn't get drawn into any extended discussion of The Play until now. Frankly, I didn't know people were upset. Ignorance was bliss. I obviously saw the play go down. It was crap from start to near-finish — crap throw, crap receiver, crap linebacker, crap pass interference call, crap delay — but the result seemed to be the only sane one, a belated no-call. Bill Barnwell wrote today that it was pass interference by the letter of the law, but he, unlike pretty much everyone else, understood how the refs got from point A (flag) to point B (no flag) without pillorying them too hard. "The whole thing speaks to a problem in the officiating process," he wrote. "We expect officials to huddle and debate what they saw from different vantage points a full minute after a play ends without the benefit of any replays, and the margin of error in that process is simply way too high." Barry Petchesky didn't let Pete Morelli's crew off so easily. "In Morelli's version, the system worked; officials communicated with each other to get the call right," he wrote. "But that's not how we saw it play out, and that's the failure on the field the gives the NFL and its officiating a deserved black eye today." This seems to be overwrought to the point of dishonesty, more concerned with optics than the truth of the thing, which basically inverts Deadspin's mission statement to ferret out what's real and focus on that. My own biases come into play here: I didn't think the play rose to the level of obviously or even likely pass interference, despite Barnwell's rulebook citation. I'm neither a Cowboys nor Lions fan, nor do I love the 49ers, but I'm still more concerned with how Michael Crabtree getting held on the last real play of the Super Bowl, with no call, than how the refs in Dallas picked up what was at best a supremely ticky-tack flag in the wild-card, igniting a million conspiracy theories. That was a few years ago, but I've retained the information toward what I think is the honest end of judging the NFL not just against its rulebook, but against itself, which it's forced to do on every play just to triage itself into something worth watching. A sport that is decided by that call isn't one I want to watch. As someone who watches just as much NFL football as you likely do — i.e., all of it — I've accepted that rules are applied haphazardly and inconsistently and are generally incompatible with football as we know it. I strongly believe that whatever discretion is given to referees was deployed correctly last night, and went further toward avoiding a farce than creating one. The refs had five minutes to get it right, and we've had more than 15 hours. 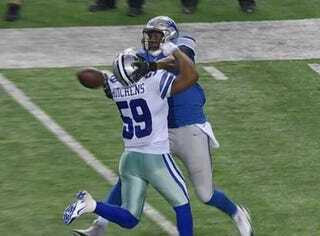 The play was barely worth the handful of seconds it lasted, from a football standpoint. If we can't move on, why are we watching at all?